Considering the lack of lefties the Yankees have in their system as a whole, the Thunder’s starting rotation is pretty well-balanced. If you take Wright out and add Smith, then you’ve got four righties and one lefty…take out Coke and add Marquez (possible when Karstens comes back) then it’s five righties and no southpaws. I don’t like Kroenke as the only lefty. His Tampa numbers were great, but his Thunder stats were anything but. If you need to bring someone in from the pen in a specialized situation, how reliable is he going to be? Again, there is a serious lack of top-level talent from the left side of the mound in the Yankees organization, and the supposed weak points of both the bullpen and rotation will come from there — Coke and Kroenke. A lot of versatility here at the plate. I think Carson and Malec will be pretty interchangable at the DH spot, but he too is a switch hitter. Tony Franklin should have a lot of options for late-game situations with this lineup. Some decent late inning options here, as well as players that Franklin can be comfortable inserting into his lineup if someone gets called up or injured. Muich probably won’t see a lot of time behind the plate, and he’ll need to do better than he did in his brief call-up last year. Moosic, PA – The New York Yankees have released the Scranton/Wilkes-Barre Yankees 2008 opening day roster. Eleven members of the 2008 squad spent time with the SWB Yankees during the 2007 season. In addition, 12 players on the opening day roster spent time in the Major Leagues during the ’07 campaign. Pitchers Chris Britton, Kei Igawa, Scott Patterson, Edwar Ramirez, Darrell Rasner, Jose Veres, and Steven White all appeared in games with Scranton/Wilkes-Barre during 2007. While not a Yankee in 2007, pitcher Dan Giese is very familiar with PNC Field having spent the 2003 – 2006 seasons as a member of the Scranton/Wilkes-Barre Red Barons. Eric Duncan, Alberto Gonzalez, Justin Christian and Brett Gardner are the returning position players from 2007. INF Nick Green (Mariners), OF Jason Lane (Astros, Padres), C Chad Moeller (Reds, LA Dodgers), LHP Heath Phillips (Chicago White Sox) and INF Cody Ransom (Astros), all saw time in the Major Leagues in 2007 and will bolster the depth and experience of the team. RHP Alan Horne, RHP Jeff Marquez and C Jason Brown spent all of 2007 with the Eastern League champion Trenton Thunder. 1B Juan Miranda began the ’07 season with Tampa of the Florida State League before finishing the season with the Eastern League champs. INF Bernie Castro (Columbus Clippers), OF Greg Porter (Arkansas Travelers, Salt Lake Bees) and RHP Scott Strickland (Portland Beavers) round out the 2008 Yankees roster. Manager Dave Miley, who guided the Yankees to an International League best 84-59 record in 2007, is back at the helm and will be joined by returnees; hitting coach Butch Wynegar, coach Alvaro Espinoza and athletic trainer Darren London. The newcomer to the field staff for 2008 is pitching coach Rafael Chaves. Scranton/Wilkes-Barre opens the 2008 regular season at PNC Field on Thursday, April 3rd with a 7:00 pm first pitch against the International League’s new franchise, the Lehigh Valley IronPigs. Have confirmed, and Chad Jennings is also reporting, that tomorrow’s pitching matchup will see Phil Coke on the hill for Trenton opposed by Scranton’s Jeff Marquez. That also means that Coke will be the team’s #5 starter, which had been expected for a while now. Should be interesting to see how long they go. I’d imagine it would be like a regular early-season start, where they’ll go five innings. You want to get your guys stretched out, but you also don’t want to risk hurting anyone in what is essentially a completely meaningless game. Have been able to confirm this with a few people, but it isn’t set in stone. For example, when Jon Albaladejo comes down once Andy Pettitte comes off the DL, that will have a trickle-down effect. Carson at DH is somewhat of a guess, but they need to get his bat in the lineup, and none of the outfielders are coming out of that lineup to do it. Maybe Matt can learn how to play first this year to help his chances of playing. Ben Julianel, a reliever who appeared in 52 games for the Thunder in 2004 and 2005, will start the season in Double-A New Britain. Jeff Nettles, former Yankees farmhand and son of Bronx legend Graig Nettles, has signed with the Baltimore Orioles and will start the season in Double-A Bowie. This comes after he was released by the Royals despite hitting over .350 in camp and connecting for three home runs in one intrasquad game. Chad Jennings is reporting that Chase Wright has been sent back to Trenton. Bumped out of the rotation and back to Tampa is Brett Smith, who seemingly can’t catch a break after throwing a rain shortened no-hitter less than a year ago at Waterfront Park. That would then set the rotation as: Chase Wright, Dan McCutchen, George Kontos, Phil Coke and Jason Jones. So far, we’ve taken a look at the Thunder’s All 15 Year Team nominees for catcher, first base, second base, shortstop and third base. What can I tell you about David McDonough, our featured writer, that I haven’t copied and pasted five times now? Well, Dave is…ummm…Irish. So he’s got that going for him. Outside of that, McDonough’s entering his 15th season of covering Thunder baseball. One of the most helpful people on press row, Dave’s been up close and personal with just about every single player on the entire ballot, and provides unique and interesting stories that you won’t be able to find anywhere else. Andy Abad: When your manager says to the organization, “Get him out of my sight,” it’s probably not a good sign. To Andy Abad’s credit, he overcame that stigma to become, if not a big league star, a least a valued minor leaguer. Andy was a not particularly successful first baseman/outfielder in his third pro season, batting .240 for the Thunder, when he got into a bar brawl in Trenton one night in 1995. He denied everything, and then admitted to manager Ken Macha the truth of the matter. Macha was disgusted with his 22-year-old outfielder, primarily for lying, and banished him to Single-A Sarasota in the Florida State League, from where so few return. But Abad did come back, half-way through the 1996 season. He was more thoughtful, more serious and incidentally, a better hitter, batting .277 in 213 at bats. He never shook the journeyman status, though. He batted .303 in 45 games in 1997 for Trenton, and went on up to Triple-A, where he showed some power. He’s bounced around Triple-A ever since, with time out for a year in Japan, and has gotten 198 big league at bats with Oakland and the Red Sox. He spent 2007 with the Brewers Triple-A club, batting .316 in 83 games, and is known as a model citizen. Raul Gonzalez: So many of the players on the Thunder list were veteran minor leaguers having good seasons in their third or fourth go round of AA ball. Gonzalez was one of the best. At age 25, in his third full year of AA, he knocked 103 runs, still a club record, with the 1999 Thunder. He batted .335, second best in club history, and had 33 doubles. He was a AA All-Star and he was also a very good mentor to the younger players, too. It was his only year in the Red Sox organization. He played through 2006, hit well in Triple-A, and got a fair amount of time in the big leagues with the Mets in 2003, as well as odds and ends with the Cubs, Reds and Indians. He finished up in Indy ball in 2006. Melky Cabrera: Melky won’t turn 24 until late in 2008, and he still may turn out to be one of the best players to come out of Trenton. He was only 20 when he played center field in for the Thunder in 2005, and hit well enough for May and June to go up to AAA Columbus, and then on to New York on July 7. He flopped badly in six games, and thank goodness that George Steinbrenner was making fewer and fewer decisions for the Yankees, or we probably never would have heard of Melky again. Instead, cooler heads like Brian Cashman’s prevailed, and Melky was sent back to Trenton – where he was still one of the younger players in the league. Finishing the year with a Trenton August, he righted himself, and was in New York again for the 2006 season. He had a good year for a 23-year-old in 2007, batting .273 in 150 games for the Yankees, and with Johnny Damon no longer able to play center field, Melky’s future should keep getting better and better. Michael Coleman: If only Michael Coleman had been as good as Michael Coleman thought he was. Actually, he was pretty damn close. He was highly recruited as a high school football player (Alabama offered him a scholarship), but chose baseball when the Red Sox came calling. He was only 21 when he played an excellent center field for Trenton in 1997, and he batted .301 with 14 homers, 58 RBIs and 20 stolen bases in 102 games. Baseball America voted him “Best Defensive Outfielder” in the Eastern League. He batted .367 with five homers and 21 RBIs in July, and the Sox promoted him to Triple-A Pawtucket. He hit well in 28 games for Pawtucket, too, and earned a trip to Boston in September. But Coleman had had an attitude problem since Day One. He had never been shy about revealing when he thought he wasn’t being moved up fast enough – which was almost always. When he arrived in Boston with his self-appointed nickname, “Prime Time”, demanding to pick his own uniform number, he rubbed a lot of the veterans, including Mo Vaughn, the wrong way. “Who named him that?” demanded Vaughn. “…to get a nickname, you’ve got to put some time in.” It didn’t help that Coleman struck out 11 times in 24 at bats. That was about it for Coleman. He spent all of 1998 in Triple-A and even his 30 homers at Pawtucket in 1999 rated only a 2 game stint in Boston. He got shipped off to the Reds with another Red Sox disappointment – Donnie Sadler – in the winter of 2000, and in the spring of 2001, the Yankees picked up him, along with another famous flop, Drew Henson. The 12 games that he got into with the 2001 Yankees was his last glimpse of the big leagues. He drifted off into Indy ball, although curiously enough, all three of the organizations he played with in organized ball – Boston, Cincinnati and the Yankees – re-signed him at one point or another. In 2005, the Yankees, having signed him out of the indy Atlantic League, sent him to Trenton, eight years after the debut in this town that had seemed so promising. The 29-year-old went through the motions for 42 games without much fanfare. 2006 was the last time he played pro ball. But he was awfully good that first time around in Trenton. Brett Gardner: He’s fast and he can hit okay. He plays with great intensity. He’s the highest drafted player ever out of the College of Charleston. Baseball America lists him as the #8 prospect in the Yankees system. There’s no doubt in my mind that Brett will be a big-leaguer, but I am not yet convinced that he’ll be an everyday player. He didn’t hit Eastern League pitching all that well his first time through (a .272 average in 217 at bats in 2006) and his vaunted base running wasn’t always wisely chosen – although he did steal 28 bases, and 18 more when he came back last year and hit .300 at Trenton in 203 at bats. He missed a month with a broken hand last season, but finished up well with Triple-A Scranton and then batted .343 in the AFL. He hasn’t got a great arm but covers plenty of ground in center field. If fellow centerfielder Austin Jackson has a good season in Trenton this year, and Melky Cabrera continues to develop, Gardner could be traded. And if hard work is the key, he will definitely be in the big leagues soon. Adam Hyzdu: Adam signed with the Red Sox on April 26, 1996. He reported to Trenton half-way through the next night’s game, persuaded the crack Thunder security staff to let him in, introduced himself to manager Ken Macha, was inserted into the game as pinch-hitter, and promptly hit a home run. It was that kind of a season for the ex-first round draft choice of the Giants. In what is probably the best all-round year a Thunder player has ever had, Hyzdu batted a club record .337 with 25 homers and 80 RBIs in 374 at bats. He was also a pretty good left fielder, and made the All-Star team. Not bad for a 24-year-old who had been released by the Reds organization that March. Adam hit well in Triple-A the next year, but the Red Sox saw no place for him. He was in the DBacks system for a year, and played in the Eastern League again in 2000, when the Pirates signed him as a free agent. He tore things apart, leading the league in homers and RBIs. He got some at bats in the majors with the Pirates every year from 2000 through 2003, and the Red Sox even re-signed him and gave him 10 at bats in 2004 and 16 in 2005. He sipped the coffee twice more, with the Padres and Rangers, and spent 2007 in Japan. He hit 280 minor league home runs, and in parts of seven big league seasons, he had a total of 358 career major league at bats. A lot of guys would love to be able to say that. Trot Nixon: Was anyone ever tougher on himself than Trot Nixon? He felt the burden of being the Red Sox number one draft choice very keenly. Here was a guy who, if he went 2 for 4 would spend hours worrying about the two hits he didn’t get. Add to that the fact that he was already experiencing the back problems that would shorten his career in Boston, and you have one worried warrior. Fortunately, everyone in the Red Sox organization knew what Trot was going through, and he had a lot of support from manager and coaches. At age 22, he played 123 games in 1996 with Trenton, batted .251 with 11 homers, played an excellent right field, and started, very gradually, to let up on himself. It took a couple of decent years in Triple-A for him to get his game together, but he ended up as a fan favorite at Fenway for his determined style of play and his slugging against right-handers. The injuries have caught up with Trot, who played for Cleveland in 2007. As of this writing, he has signed a minor league contract with the DBacks. Red Sox fans will always remember him as a part of the 2004 championship team. Dernell Stenson: Part of the tragedy of Stenson’s violent death in 2003 was that the Cincinnati Reds really felt he was at last coming into his own as a ballplayer. Dernell was the original tools guy – a very raw young hard hitter when he was drafted by the Red Sox in the third round in 1996. He was in Trenton by the start of the 1998 season, and was called the Best Hitting Prospect in the league by Baseball America. The 20-year-old hit 24 homers in 138 games for the Thunder and scored 90 runs. He also struck out 135 times, and, just three years removed from being a high school pitcher, had a lot of trouble playing the outfield. That seemed to prey on Stenson – throughout his time in the Red Sox system, his struggles with the outfield, and later first base, seemed to affect his overall game. Each year, he’d hit some homers, but never seemed to put together that one season the Red Sox were looking for. Baseball America called him the Sox’ top prospect in 99 and 2001, but that’s what he stayed – a prospect. He also ran into some off-the-field personal problems. After he had spent 3 ½ years at Triple-A Pawtucket, the Reds claimed Stenson on waivers. They let him play at Double-A again, and felt he had gained enough confidence to bring him up to the big leagues for 37 games at the end of 2003. They spoke of having him in their plans for the 2004 season. But on November 5, 2003, in Chandler, Arizona, while Dernell was playing fall baseball, he was robbed and murdered. He was the first ex-Thunder player to lose his life. At 25, he should have had years of living and baseball ahead of him. Kevin Thompson: The fleet outfielder can run like the wind, but has never hit consistently. He stole 47 bases in 86 games for the 2003 Thunder, and was caught only eight times, but he only batted .226 in 328 at bats. He did better in 04 and 05 (.329 in 81 games for the Thunder) but there are other more talented players ahead of him in the system. He got a few games in with the Yankees in 06 and 07 before the A’s picked him up during last season. Not On the Ballot: Justin Christian: Signed as an undrafted free agent out of indy ball, Justin stole a club record 68 bases for the Thunder in 2006, and has 28 multiple hit games. He wasn’t hitting well in Trenton in 07 (.235 in 65 games) when he was promoted to Scranton in July, where he took off, bating .325 in 40 games. A clubhouse leader, he could help someone off the bench. It’ll have to be soon, though – he turns 28 in April. Ashmore’s Thunder Thoughts: This is where it starts to get really, really difficult. There are just so many options when it comes down to the outfield, starting pitching and bullpen. As far as the outfielders go, eight of the nine guys on there made it to the big leagues after they played in Trenton. The ninth, Brett Gardner, was in serious contention to make the Yankees this season and will almost undoubtedly be in the Bronx at some point in 2008. Andy Abad: The way he pissed everyone off after his little bar incident is a somewhat legendary tale over at Waterfront Park. Fausto Andres Abad — the kids call him Andy — has pretty much played everywhere you can imagine, including a stint in Japan in 2000. He’s put on 16 different uniforms in his career, but only three of those have been in the big leagues. With a whopping 5,381 minor league at-bats to his name, he has just 21 in the show. He got one of them with Oakland in 2001, 17 more in Boston two years later, and got his final three with the Reds just two seasons ago. Now 35 years old, Abad’s status for 2008 seems uncertain. Raul Gonzalez: Gonzalez is one of the best outfielders I’ve seen at the minor league level. I never really understood why he didn’t get more of a look than he did in the bigs. Sure, he was older when he finally started hitting his peak — it was his fifth year in Double-A, his third full season…but the season he put together during that magical 1999 season was the best of his career. But he was just 25…was he really too old at 25? .335, 18 home runs and 103 RBI should be the only numbers that matter. It was also the only season he was a member of the Red Sox organization, and perhaps that worked out to his favor. The following year, he signed with the Cubs and started the season in Triple-A before making his big league debut later that year. He’d go on to play for the Reds, Mets and Indians at the highest level, but he never was able to stick or become an everyday player. In 2005 and 2006, Gonzalez spent both seasons in Triple-A with the Cardinals and Pirates, respectively, without getting a look in the bigs. At 34 years old, the undersized (5′ 9″) outfielder appears to be done. At best, he was an example of the Red Sox classic mismanagement during the Dan Duquette era. At worst, he was someone who had mastered Double-A and was left there for far too long. Melky Cabrera: Cabrera was in Bill Masse’s lineup every day for the Thunder in 2005, outside of brief stints with Triple-A Columbus and the Yankees. One of the better defenders the Thunder have seen in the outfield, Cabrera also put together a solid offensive year as well, hitting .275 with 10 home runs and 60 RBI. Even being on the Yankees, it seems everything Cabrera has done has been under the radar…few probably realize that he drove in 73 runs last season in the Bronx. Seems he’s always dangled as trade bait, too. Yankee fans had better hope that stops, because Cabrera seems to be a pretty key part of the team’s future for many years to come. Michael Coleman: Every time I talked to Michael Coleman, he scared the crap out of me. And were it not for being drafted by the Red Sox, he would have went on to have people checking their pants as a football player at Alabama. Instead: “I never made it to Alabama, I got drafted and never looked back,” he told me back in 2004. He’s just an intimidating guy. But he was intimidating at the plate too, and put together a monster year in Mercer County in 1997. “I had a good year with the Thunder, I had a great time there,” Coleman said. 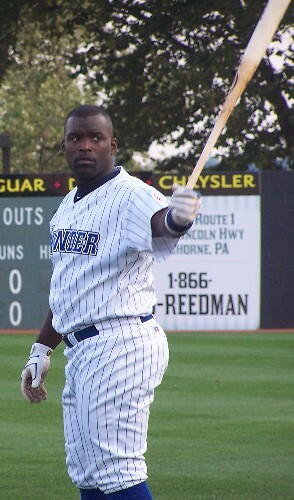 Coleman came back to Trenton in 2005, and left Thunder fans with one last memory — hitting a walk-off home run off of Portland’s Jim Mann in Game Four of the Eastern League Division Series to send the series to a fifth game. Brett Gardner: The boy can run, that’s for damn sure. Gardner swiped 46 bags in 109 games with the Thunder in 2006 and 2007, coming close to setting foot (get it…setting foot…stolen bases…I’ll stop) in Justin Christian and Kevin Thompson territory. It’s hard to believe that the 24-year-old is entering just his fourth season of pro ball. In contention for a spot on the Yankees roster this season, it’s harder yet to believe that Gardner won’t see some time in the Bronx at some point this season…and if not this summer, certainly in September. If he can get some more pop into his bat, he won’t fall into the Kevin Thompson trap of being known as a guy who’s all speed and no bat. Adam Hyzdu: Seems like any time you read one of those stories about guys with oodles and oodles (technical term) of minor league at-bats who could never really get an extended look in the big leagues, Adam Hyzdu’s name was in it. After breaking none other than Ken Griffey, Jr’s record for home runs in a season at his Ohio high school, Hyzdu was picked in the first round by the San Francisco Giants in 1990, and never played a day in the big leagues for them. Instead, he bounced around a few organizations and eventually got to the bigs with the Pirates. But inbetween being drafted and his big league debut, Hyzdu wore a Thunder uniform in 1996, hitting .337 with 25 home runs and 80 RBI while doing so. An Eastern League All-Star, Hyzdu put up similar numbers the following season for Pawtucket — but in a stunning development considering how well the Red Sox handled their prospects during this time period — never reached the bigs during his first stint in the organization. He did return to the Sox in 2004, and even got into a playoff game for them in 2005. A veteran of a mindboggling 1,750 minor league games, Hyzdu has just 358 MLB at-bats to his credit. 36 years old, Hyzdu is a free agent and is probably done after playing one final season in Japan. Trot Nixon: Sure, Trot Nixon played for the Thunder in 1995. You know this by now. But for as long as he lives, Christopher Trotman Nixon will always be asked about what it was like to bring Red Sox Nation their first World Series in 86 years. “I got the opportunity to live out one of my dreams, and also fulfill the fans dreams to win a championship in the Boston area,” Nixon told me last year. Even after years of dealing with the scrutiny of playing in Boston, Nixon insists that his first season with the Indians hadn’t changed anything. “Baseball is baseball,” he said. Now 11 seasons and one World Series ring removed from wearing a Thunder uniform, one thing’s for sure. Trot Nixon will never forget the Trenton faithful. “In some minor league parks, you don’t get that much support,” Nixon said. After a lackluster season in Cleveland, and equally iffy spring training this year, Nixon has been sent to the minors by the Arizona Diamondbacks to start the season after trying to learn first base to help his chances of making the team. Dernell Stenson: What a shame. I thought about just leaving it at that, because it really would sum things up, wouldn’t it? Who knows what would have become of Stenson had he not been tragically murdered a few years ago? Once thought to be Mo Vaughn’s replacement over on Yawkey Way, Stenson was picked in the third round by the Red Sox in 1996. With the Thunder in 1998, he hit .257 with 24 home runs and 71 RBI — the 24 dingers would be his career high. At least he finally got to reach the big leagues in 2003 with the Reds, hitting .247 with three home runs and 13 RBI in 37 games. It looked like he had a future with the Reds…a future that was ridiculously taken away from him by a few you-know-what’s who wanted his truck. Kevin Thompson: Thompson and Justin Christian would probably be interchangable on this list were it not for Thompson reaching the big leagues with the Yankees. Thompson was claimed on waivers by Oakland last September and didn’t really do too much to stand out there, instead signing with the Pirates this off-season. He’ll start the year in Triple-A. In 2003, Thompson set the Thunder’s single season record for stolen bases in a season with 47. Over the next two seasons, he’d add 54 more for a total of 101 steals in a Trenton uniform. Not On The Ballot: Justin Christian: If you didn’t have the list of guys who are on the ballot in front of you, you might be willing to make a stink about JC not being on it. To be honest, Christian’s future with the Yankees seems pretty bleak with the emergence of Gardner. At one point, they seemed to be pretty even, but Gardner has clearly passed Christian and established himself as the Yankees first option for an outfield call-up. Regardless, Christian’s story is one of the more intriguing ones you’ll find in minor league baseball. Undrafted after spending time at three different colleges, he signed with the River City Rascals of the Frontier League and played there for parts of 2003 and 2004 before signing with the Yankees after hitting .450 in 120 at-bats for the Rascals. “(River City) gave me an opportunity to play out of college,” Christian said in 2006. My Votes Go To: Raul Gonzalez, Adam Hyzdu, Dernell Stenson. I was very, very close to having Justin Christian in one of these spots. Real close. Quietly updated the blogroll with Pinstripe Alley, a daily Yankees blog. Again, I will link to any Yankees or Eastern League related site at my discretion. Also, I will not link to any sites that primarily provide paid content. Many reasons for that. Been getting a few e-mails wondering when I’ll have some stuff about this year’s version of the Thunder. The answer? April 1st. No joke. I’ve said it before…but again, I’ll have team info, player and coaching staff quotes, and whatever else you see on the other beat writer blogs. Had I started this last season — and there was a bare bones version on Blogger last year — you’d have an idea of what to expect. I work for a pretty small paper. The publishing company is actually pretty big…but the paper itself isn’t that big, and the budget therefore isn’t big either. The Thunder and “my other beat” are the only two professional teams the paper covers. They instead choose to focus on high school sports, which is fine. It’s essentially a long winded way of saying that my stuff isn’t priority number one, and they aren’t going to pay for me to go down to Florida. I’m not paying for me to go down to Florida, either. Several weeks of hotel rooms, food and other expenses out of my own pocket doesn’t sound like a thrilling idea. I have a commitment to the other beat on the 14th, and the game on the 16th is an 11:05 start. One day, I will go into a Dennis Miller-style rant as to why I hate what are known as camp days oh-so-very much (most writers love them, actually…no worrying about deadlines, etc.) but I’ll save that for another time. Regardless, while you can get some killer photos on those days, I’ve found that my ability to do actual work tends to be not so good on those days since teams generally report to the ballpark significantly later than they would on a “regular” game.